The Global Positioning System constellation of satellites has been helping lost travelers find their way for a while now, but they only really started showing up in cars in the mid- to late- 1990s, and in big numbers even later than that. 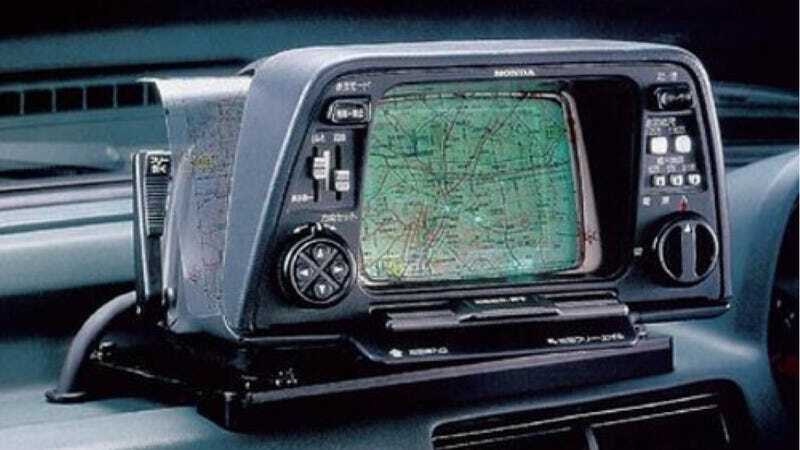 But the first automotive navigation system was offered over thirty years ago. It was called the Honda Electro Gyro-Cator, and if you notice, I'm being very judicious in not calling it a "GPS navigation system." That's because it didn't rely on satellites, GPS or otherwise, to tell you where you were going at all. Rather, it was more like the inertial navigation systems used by fighter pilots in the Cold War. Inertial navigation systems are based on a pretty simple principle. If you know where you started, you know how far you travelled, and you know which direction you were headed in, then it should be easy to know where you are. Apply that concept continuously, and you've got the workings of a basic navigation system. The challenge is in making that system accurate, durable, and actually knowing where you started to begin with. To make it accurate, Honda, along with Alpine and headlight maker Stanley Electric, devised a system whereby a servo gear was hooked up to the transmission, so that the analog computer knew how far the car had gone. To know which direction the car was headed in, the system relied on a jet of helium gas, ran between two wires, to function as a gyroscope. The suggestion was that the gyro's direction-sensing function could be used to guide a car if zero was constantly adjusted to the target road. The team began experimenting immediately. First, a map was drawn on a transparent sheet, then the target route was traced using a black, felt-tip marker. The objective of their experiment was to confirm whether the sensor could follow the route and guide the car. In fact, their initial results were highly encouraging. Subsequent experiments examined a more advanced idea, attempting to determine whether the sensor could pinpoint its own location according to road patterns and the car's direction of travel. This indeed became the starting point for important research, eventually leading to the world's first automotive navigation system: the Honda Electro Gyrocator. Yep, the idea was that simple. Take a plastic sheet, mark your starting point on it with a marker, and head off from there. If you overlay a map onto that plastic sheet, then you essentially have a navigation system. Okay, so it doesn't offer turn-by-turn directions, but it's better than nothing. To use the system, you'd just select a map out of your enormous binder of plastic maps, draw on it, like children and elementary school teachers with a love of overhead projectors do, shove it into the slot in your nav system, position it just right, make sure you're not off by 500 feet, and off you go. You would appear as a little blinking blip, with a trail of crumbs behind you, and you'd follow along on the map that you inserted to determine where you were. It was all in monochrome, of course, because it was the 1980s, and that was all people had on their computers. Either that, or everything being in one color was considered quite fashionable. I'm not sure, as it was the 1980s, and the whole world had gone a bit mad, style-wise. But it worked for Oregon Trail. Also, it's possibly a lot easier to use than a lot of current navigation systems. Honda doesn't say how many cars they sold that were equipped with the Electro Gyro-Cator, but it couldn't have been very popular. It was offered as an option on the Honda Accord, and cost over $7,000 in 2014 money. And that was hugely expensive for some plastic maps. Nevermind all the complex inner workings.